Years and years and years ago when I was but a wee lass, I just knew, deep down, that I was destined to live abroad. It wasn’t a dream or a whim or a young girl’s fantasy, but a real need that seemed to arise at an early age. Perhaps it was my own name that drew me back toward my ancestry; perhaps I was merely born out of place. Whatever the cause, I knew only that I wasn’t yet home. Recently, a long-lost friend I haven’t heard from and couldn’t find for twenty-five years sent me an email through this site. We were undergrads together, and I credit her with introducing me to my pal Dorothy Parker and for otherwise broadening my literary horizons. The years fell away as if we two blonde English majors were still back in the dorm, mocking a certain pompous prof, grumbling over journal entries, fighting off a general ennui. She’s still the same thoughtful, poetic soul I knew her to be. I have spent my life in clearing out of poetry every phrase written for the eye, and bringing all back to syntax that is for ear alone. At some point, I mentioned wanting to broaden my NWR classics series to include poems for high school students, and she immediately sent me one of her favorites, “The Lake Isle of Innisfree.” I don’t think I’ve read this poem since she first shared it with me all those years ago, and it was like reading a long, slow sigh of goodness. …and in reading his poem, I realized he’s describing the Innisfree I have found in my home abroad. I may be less of a lass and a bit shy of wee, but I have some peace here. So this one is for my friend J.A., thanking her for the reminder and for re-introducing me to another lost friend in Yeats, and hoping from the deep heart’s core that she’s found her Innisfree, too. And live alone in bee-loud glad. 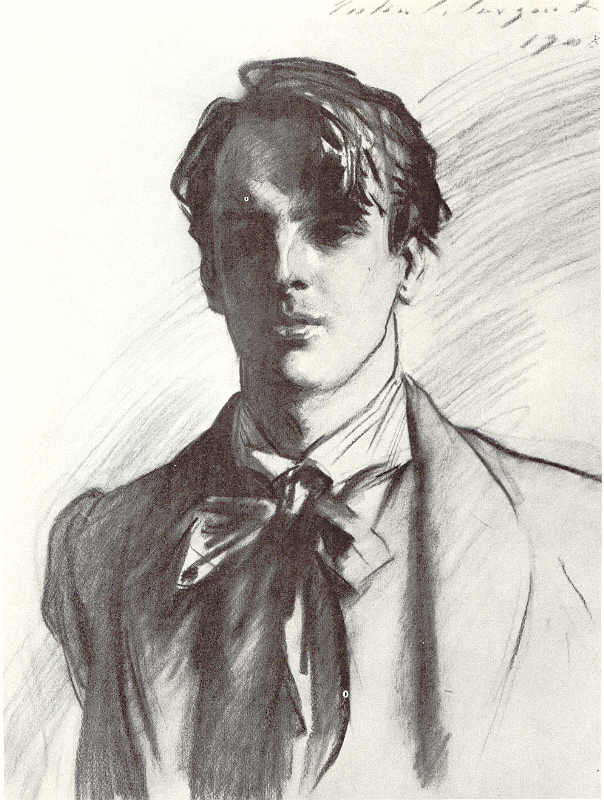 THE DASHING YOUNG POET, W. B. Yeats, by John Singer Sargent, 1908. Public domain. Occupation: Writer, Poet, Playwright, Cofounder of Irish Literary Theatre, Senator of the Irish Free State, 1923-29. Works: Poetry, plays, essays. Alphabetical listing of poems. Links to collected works. Mr. Yeats, thank you for stopping by No Water River today. It was kind of you to make time for a stranger. Aw, that’s sweet. Then welcome, friend. Our world is quite different from the one you knew. In some ways better, and in some ways much worse. What would your ideal world look like? I would mould a world of fire and dew / With no one bitter, grave, or over wise, / And nothing marred or old to do you wrong. That sounds like heaven! Do you have a special place where you write, a place that inspires you? Where the wandering water gushes / From the hills above Glen-Car, / In pools among the rushes / That scarce could bathe a star. I was always discovering places where I would like to spend my whole life. Where do get your ideas for your poetry? The mystical life is at the center of all that I do and all that I think and all that I write. I desire a mysterious art…doing its work by suggestion, not by direct statement, a complexity of rhythm, colour, gesture. Many young or new writers don’t feel comfortable calling themselves “poet” or “author.” What is your definition of a true poet? A poet is by the very nature of things a man who lives with entire sincerity, or rather, the better his poetry the more sincere his life. A poet creates tragedy from his own soul, that soul which is alike in all men. A poet writes always of his personal life, in his finest work out of its tragedies, whatever it be, remorse, lost love, or mere loneliness. Like a long-legged fly upon the stream / His mind moves upon silence. Can you share a lesson that you’ve learned about writing? I lie awake night after night / And never get the answers right. (Join the club!) Write for the ear…so that you may be instantly understood as when an actor or folk singer stands before an audience. What’s your best advice for aspiring poets? The world is full of magic things, patiently waiting for our senses to grow sharper. Let us go forth, the tellers of tales, and seize whatever prey the heart long for, and have no fear. Hammer your thoughts into unity. And walk among long dappled grass, / And pluck till time and times are done / The silver apples of the moon, / The golden apples of the sun. Favorite lines to impress the ladies? I looked upon the moon, / Longing to knead and pull it into shape / That I might lay it on your head as a crown. I kiss you and the world begins to fade. While still I may, I write for you / The love I lived, the dream I knew. Delight my heart with sound; speak yet again. Quick! Write us a couplet using the word body! Look for images of Innisfree, a little island in Lough Gill, County Sligo, Ireland. How has Yeats captured this place in his poem? Read the poem aloud in groups and listen for the sounds and rhythms Yeats uses to create aural imagery of Innisfree. 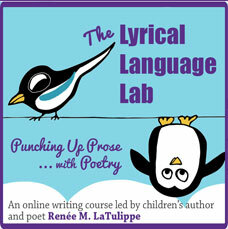 Find examples of internal rhyme, alliteration, sibilance, onomatopoeia, and assonance. Study the meter. Discuss the effects these devices have on the poem and the reader. 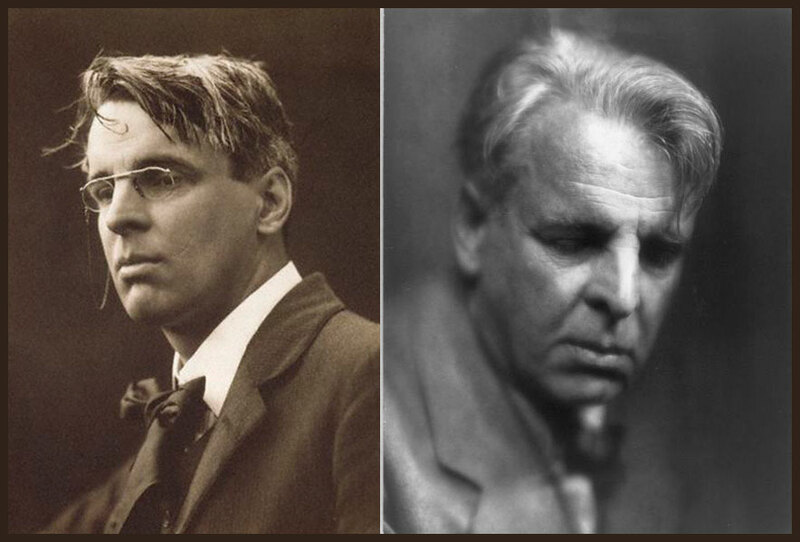 Listen to W. B. Yeats recite his own poem. Do you think he captured the feeling of his own words? Why or why not? How would you read it differently to convey how the poet feels about Innisfree? Where is your “Innisfree” – your special place that you dream about? What does it look like? What do you do there? Who or what lives there with you? Create a list of images and phrases answering these questions and write your own Innisfree poem. The “interview” above was created using quotes from Yeats’ autobiography and snippets from his poems. Choose your favorite poet from the past and do a little research to find quotes and poems by that poet. Then put together your own interview that gives some insight into the poet. Look at this beautiful “poetry comic” created by Julian Peters for the W. B. Yeats poem “When You Are Old,” done in the style of a Japanese manga. Choose any Yeats poem and use the words to create your own art piece, whether it be a painting, collage, comic, sculpture, or even a board game! Bake some Irish lace cookies and enjoy them with a spot of tea. Poetry Friday is hosted by the charming Marjorie at Paper Tigers. 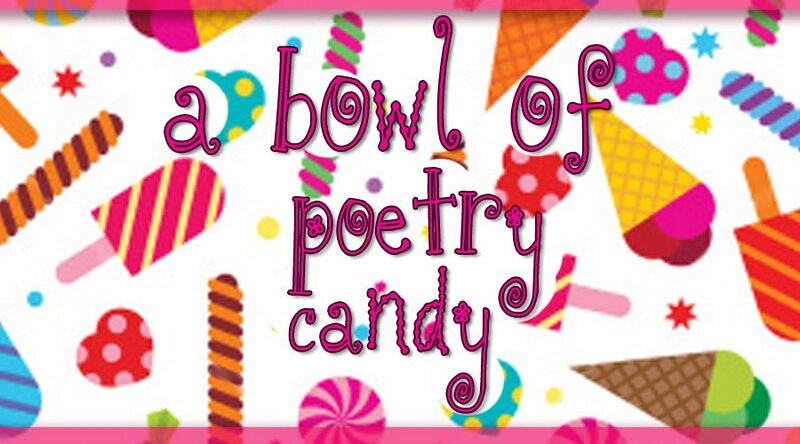 Skip on over there to see more dreamy poetry offerings! Video Location: My personal Innisfree: a sun-dappled path overlooking the Bay of Baratti in the Etruscan hamlet of Populonia, Italy. 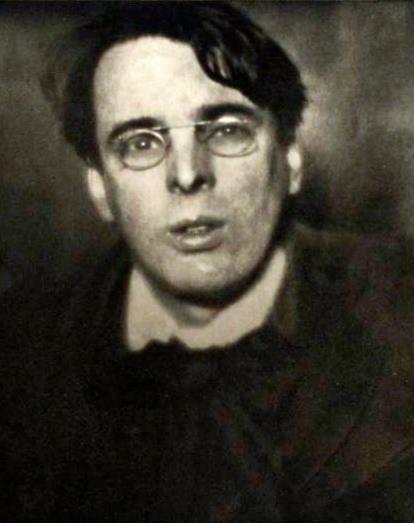 “The Lake Isle of Innisfree” by William Butler Yeats is in the public domain. *Quotes and lines of verse by W. B. Yeats used in the interview culled from the Twitter account @YeatsDaily. Brilliant. It has been far too long since I heard/read some Yeats. I am glad you gave us your version and the bard’s own. Your activities are beautiful, Renée, but the interview was the highlight for me today! Well, and the swoon stanza, which I have already copied and sent to a friend! I know! Where has Yeats been all my life? Time to rediscover all these marvelous poets. And I am not kidding about the swooning — is that gorgeous or what? Pingback: Poetry Friday is Here – Welcome! Interesting how much he and Robert Frost resemble each other in old age…a poet’s face indeed. Clearly, I need more coffee! Yes, I think W.B. is a fine Darcy replacement. I’m on it! Wonderfully creative, Renee. I wonder if some high school students studying poetry might take your idea and create their own interview of a favorite past poet? I love Yeats and believe it’s wonderful we can still hear him read Innisfree. And I enjoyed your passionate reading too. Thank you for every bit today! Now why didn’t I think of that? What a great idea – I’m adding it now. Thanks for the tip, Linda! My goodness, Renee, I haven’t thought about Billy B since Mrs. Cook’s room in 5th grade! Only his friends called him that, of course. Good for you for bringing him back. I hope he’s on Facebook. I have a lot of questions. For one thing, I thought Eloise was MY girl until he came along. Rats. The guy’s everywhere! But at least he didn’t get Eloise either. I heard she fell for guy named Longfellow. See what he says when you interview him. Loved the interview in particular – and to hear those beautiful words. This is “Blog Post of the Year” quality, Renée. Brilliant setup, content, and format. And your “delivery”, as always, is perfect. My sentiments exactly, well said Ed! Thank you, Ed and Catherine. Hmm…getting a sports guy to swoon? That Yeats elixir is stronger than I imagined! I copied the poem to our kitchen whiteboard so we could enjoy it all day long. Great resources and I love the interview! Oh, I love knowing that, Heather. The poem gets more lovely each time I read it. I’ve always loved this poem, Renee, so thank you for featuring it, as well as the wonderful video! And the idea for the body of the post was coincidental, as I’ve been studying found poems – and here you have a ‘found’ interview! Very well done. I’m telling you, I have found many treasures to mine on Twitter! “Favorite Lines to Impress the Ladies” — you crack me up! I remember sharing this poem many years ago with ninth graders who were reading A Tree Grows in Brooklyn. It prompted a unit-long discussion about dream-places that enriched the students’ whole experience of the novel. Thanks for sharing it today. @ Erik – Glad you enjoyed it! @ Laura – Aren’t ninth graders the best? That unit sounds pretty magical – love it when that happens. This has long been a favorite of mine, Renee — my Mum and I used to recite it together. The words lap over me like lake water, with low sounds. Mmmmm…. Thank you. And what a delicious “interview”! One of the perks of these classic videos is that, once memorized, the poems tend to stay with me. It’s so nice to carry it around in my head to recite whenever I want. “The words lap over me like lake water, with low sounds. Mmmmm…” Ahhh, yes Beth! Beautiful and fitting. Delightful! Makes me think of our own Innisfree, called Idyllwater. Love the Sargent portrait. What a great name, Idyllwater. Yum. Yes, that portrait is swoon-able! Such a lovely poem and you read it so well! Thank you for gracing us with this today. This is one of my favorites. I discovered this poem when reading/listening to Poetry Speaks. What a special post you have here. Thank you so much for sharing it and reminding us all to dream of our Innisfree. Renee, I would love to be a student in a live classroom setting with you. You are amazing at bringing poetry to life. Your reading was wonderful. The idea of this kind of an engagement with a loved poet is a beautiful tribute, and an amazingly creative idea. Well, no live setting, but we’ve got the next best thing in NWR. Where are your creative blankets sold? I’d like to wrap myself in one. The interview is such a great exercise. I connected on Julian’s link. Enjoyed what I saw there. Thanks for the wonderful work you put into this post for us. Well, gee, Pam, that is awfully nice of you to say. I’m surprised but glad that people are enjoying this post so much — I think it helps that Yeats has such a plethora of good stuff to share with us. It made my job easy. Absolutely brilliant, Renée! Ditto what Ed said, and might I add, perhaps the best PF post I’ve ever seen in 5 years! Truly. Your creativity and imagination know no bounds, and your reading was magical. I memorized “Cloths of Heaven” too and always swoon when I read it again. It’s something that just stays with you no matter what. Do check the revised Eye Candy at Alphabet Soup (and don’t forget to hover over the image for WBY’s personal message). No, he hasn’t quite replaced Mr. Darcy (I couldn’t do that since I’m his secret wife), but he’s definitely got swoon power! I also thought he resembled Frost when I first saw that picture. Happy PF, have a lovely weekend in your enchanted place by the sea! Well, thank you kindly, Ma’am. That is high praise indeed, and I appreciate it so much. Bring that woman some brownies! I adore the new Eye Candy and special secret message – what a treat to find it there. Grazie!!!! Jama – I love that phrase – “swoon power” !!! Renee i hope you take a step back sometimes and smile at what you have created at No Water River. A comprehensive, loving look at poets and children’s poets whose goal is to write the truth of the world as THEY see it. Continued success! Charles, that is such a nice thought. Thank you so much for the support and encouragement! Good to see that Jama weighed in with HIGH praise. Frame that one, Renee, because it came from the reigning QUEEN of creative PF posts!! As for me…yeah, what everybody else said. Especially the swooning parts. And my own personal shout-out to the part of the poem where I get to live “alone in bee-loud glad”….ahhhhh…. I know, Mary Lee, I was pretty tickled with that comment coming from Jama, Queen of All She Surveys. She must spend DAYS on each post over at her place! You’ll have to fight me for the glade, however. This is just fabulous. And the interview assignment is brilliant. Thanks so much for this post! What a swoony post! Very imaginative — I love the idea of putting together an interview in a poet’s own words. Nicely done, Renee! @ Ruth and @ Tabatha – Thank you both for stopping by to swoon! I do think this would be a fun assignment for students. I have to thank Linda Baie for reminding me to actually put it on the activities list! That was magnificent, Renée. You astound me. You made me think about so much as I read the introduction, watched the video and then read the interview. I think I was destined to live ‘elsewhere’ too although the signs were less poetic for me: when asked what I’d be when I was grown up, I’d always say an airline stewardess so I could see the world. Later on, when I was a terrible teenage waitress I knew that career path wouldn’t be a good fit. 😉 I’ll have to make some of those Irish cookies (or my Grandmother’s soda bread recipe) and you can come for tea one of these days! Dana, we have so much in common! I considered the stewardess thing, too, but I am the WORST waitress EVER!!! Except maybe for you? Haha. But I do know how to bake, so yes — I’ll bring the cookies, you make the tea, and we’ll kick up our heels and toast to Yeats and living in the great state of Elsewhere! Renée…out of lurk mode to say thanks for this juicy post! I first heard this poem in a class taught by my mentor Myra Cohn Livingston…hearing and reading it again brought it all back. April, so glad you came out of lurking to say hello! Yeats is good at bringing folks out of the woodwork, I guess. 🙂 It must be his swoon-worthiness, for sure. I lurk at your place, too, but will be sure to say hello next time I stop by. Thank you for coming! Love, love, love it! Swooning. Renee, you’re brilliant. Love the created from Twitter interview! And how lucky are you to be living in your Innisfree? I have a few places that I think about with great peace and depth and meaning, places where I have been struck by such a strong sense of gratitude for simply being a live in this beautiful world. But mostly my Innisfree is less physical place as person I’m with! Thanks for this, and how lovely to reconnect with an old friend and find you still have things in common. Thank you for sharing. You are right, Irene — it’s people who make an Innisfree! I do love the beauty and nature of where I am, and find lots of nooks that exude a sense of peace, but as I said in another comment, no place is perfect. So glad you enjoyed the Twitter interview! Thank you so much for your post. I love many of the works of W B Yeats and this was lovely reminder why. What a perfect description it is of the longing we all have for that place where we feel so happy and at peace. I’m still looking for my Innisfree. Very jealous you have found yours Renee. I know, he really did get that sense of longing so perfectly, didn’t he? Thank you for coming, Karen! And I hope you find your Innisfree, too. No need to be jealous — the BEAUTY of this place is my Innisfree, but there’s still plenty of reality to jar me out of it on a daily basis. Perfection doesn’t exist, alas. Maybe that’s what Yeats is getting at, eh? I hope he’s smiling, because it occurred to me that I could not find one photo of him smiling! He’s always doing the intense poet thing. Ah, well, we’ll forgive him, I think. So glad you liked the reading, too! Bravo! You are so clever! Renee, this post is genius. I. want you to write a whole book of “interviews” of poets and novelists, with answers taken from their work. Totally fabulous (can youn tell I am enthusiastic? ) I will buy the first copy. I’m serious. Ah, Julie, I’m so glad Yeats’s #1 fan enjoyed the post! Funny you mention the book, as the thought did cross my mind….when I have a spare year or five to devote to it! Oh, Renee – you never cease to amaze. Brilliant. I’ll buy the second copy of the book, when you get around to it. “The world is full of magic things, patiently waiting for our senses to grow sharper… ” – NWR is full of magic! Yay! I’ve sold two books! My third graders learn and recite this poem, “Jabberwocky” and, First and Second Fig!!! (Among many others…..) Now 11 years ago, I would never have thought they would be interested in poems such as these, but they learn them easily (as a group) and recite them happily. My hope is to inspire a love of language and words and poetry from a young age. We live on a lovely Finger Lake in upstate NY, so we connect to Yeats. And of course the bravehearts relish their vorpal swords and hero status! 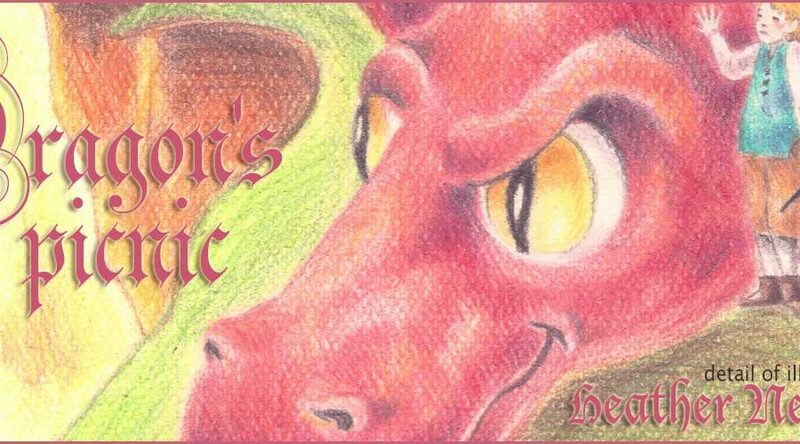 as they vanquish the Jabberwock.! Thank you for your creative interviews. I can’t wait to share them with my students…..who may or may not understand it all, but……they will benefit from your work. I agree with Ed btw!!! WOW! You have them on Yeats in third grade? That’s FABULOUS! I am duly impressed and can only say THANK YOU for instilling that love of language and poetry right from the start. It’s just so important. Did you see my Jabberwocky? Would love to know what your kids think of that and this! 🙂 So glad you came by! Absolutely beautiful. Your talent is endless!